The best part about dressing up in costumes for Halloween is the back stories you can come up with for the crazy creature or interesting character you’re portraying. When you’re running around in this Pregnant Nun Costume you could have one of the most scandalous stories to tell! Everyone will be crowding around to hear what you have to say. When someone hears the word nun, a lot of things come to mind but a pregnancy is normally not one of them. When you fully inflate the belly of this hilarious costume, you will be sure to have plenty of heads turning back for a second take, maybe even a third or a fourth. Eventually, people won’t be able to contain the curiosity any longer and they’ll need to know the story behind this costume. Are you the outcome of yet another immaculate conception? Could it be the second coming? Maybe you’ll go a bit more edgy and dark with your story. Are you on the run from a priest that wants to bury a sinful secret? Or will you be one of the pope’s baby-mamas? Maybe you can tell people you wanted to mess around a bit with the idea of costume-ception this year, a costume within a costume. So you decided to dress up as a pregnant person that decided to dress up as a nun for Halloween. Whoa… some mind-blowing stuff right there. 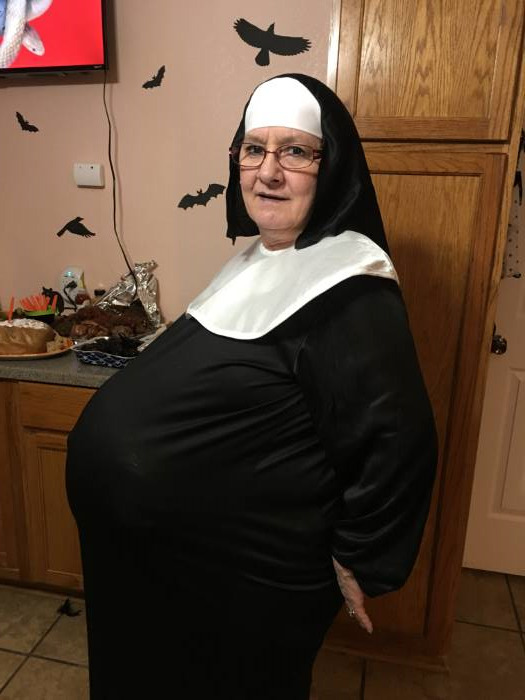 Now, you decide what your backstory is when it comes to this Pregnant Nun Costume. One thing's for sure, everyone will want to hear it. So make sure to come up with a good one! Was a great hit at the party!! Belly shaped like football. You’ll look like Hey Arnold’s mother.